Welcome to GraysOnTrays.com. I’m the editor and freelance writer and editor when I’m not snowboarding, or writing about it. I’ve also taught snowboarding for a couple seasons. 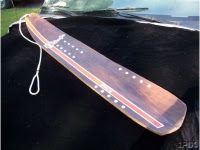 I grew up up West Michigan, one of the homes of snowboarding, and home of the Snurfer. I even had a couple of Snurfers, incluing the pro edition (below). But I never spent much time on the Snurfer. It was too hard to control, even though it was an improvement on the original version, which I also owned. The white dots you see in the first photo were raised bumps that served as the “bindings” of the day. The yellow Snurfer had staples for riders to stand on. Mountain fun or grad-school methodology? In 1993, my father-in-law invited him to a ski trip to Colorado. Rather than accept this generous offer, I decided to stay home and attend the new term in graduate school. When another invitation came up a few years later, I grabbed it. After taking some ski lessons, I was able to ski a green run from mountaintop to the base by the end of the third day. Snowboarding was so foreign to the family that I did not even think about trying it. On return trips to Colorado, I progressed to taking on some black diamond runs. Winter happens. What will you do about it? A job change and a move later, I was in Minnesota, a land of much cold and long winters. Fortunately, my new home was close to a popular, but tiny day area, which made snow sports a natural. But as you can imagine, skiing in a small space quickly lost its excitement. After roughly 30 minutes, I thought, “Is this all there is?Oh, wait. Those people look like they’re having fun on a snowboard. What’s that like?” So snowboarding then came to the rescue, making winter bearable, even enjoyable. I’m not 15 anymore. Can you write to my level? I started looking, in libraries and on the web, for information that would help me understand the equipment, biomechanics, and other key features of snowboarding: How does it work? What are the basic concepts? What kind of equipment is out there? Is there more than one way to ride a snowboard? Most of what I found, however, was either juvenile, written for 8-year-olds, or adolescent, appealing to 15-year olds, whose interests, language, and approach to life is in most cases quite different from those of adults. Figuring that he was not the only person in this situation, I decided that it was time to create a site geared for grown-ups. To serve the needs of older riders curious about snowboarding, I created the Grays on Trays website in 2003. Then I added the Grays on Trays blog in October 2004, and the Grays on Trays discussion board in November 2004. Of course, after that came Facebook, Twitter, and the like, which pretty much killed the discussion board. The response to www.graysontrays.com has demonstrated that there is a role for websites dedicated to introducing adults to snowboarding and bringing grown-up snowboarders together in this exhilarating sport. My story of learning to ride may be similar to your own. In time, became a snowboard instructor and a member of the American Association of Snowboard Instructors. Though I no longer teach, I still have a passion for introducing older adults to the sport.